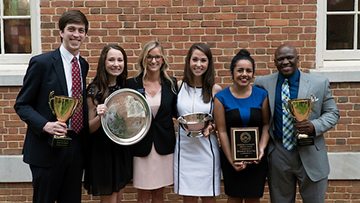 Samford University honored outstanding student leaders at the school’s 2017 leadership and service convocation May 4. Mollie Master and Erik Johansen were winners of the Omicron Delta Kappa Emerging Leader Award. This award is given to one male and one female student who exemplify character, leadership, service and scholarship. Master is a sophomore business major and University Fellow from Rockwall, Texas. Johansen is a sophomore biology major and University Fellow from Clearwater, Florida. Andrew Smotherman received the Omicron Delta Kappa Circle Leader of the Year award for exemplary service to the circle and to the Samford community. The senior business major from Carmel, Indiana, has served as circle president this year. Emily Jenkins, Caleb Jones and Austin Lively received Luke 2:52 awards, given annually to undergraduate students who excel in all areas of student life: civic, social, spiritual and physical. Jenkins is a senior religion major from Prattville, Alabama. Jones is a senior journalism and mass communication major from Roswell, Georgia. Lively is a sophomore premedicine student from Houston, Texas. Juliette Stanley and Stone Hendrickson were cowinners of the Rufus W. Shelton Community Service Award. Elizabeth Poulos received the Gayle Hyle Memorial Award as the woman in the graduating class who best exemplifies Christian character, leadership, school spirit and service. She was cited particularly for leadership of the University Fellows program, where she served as a preceptor, and was frequently called upon to provide support and assistance for younger fellows. Poulos also played an integral role in the founding of the Science and Religion Club, in addition to serving as an SGA senator and orientation leader. Poulos is a science and religion major from Mountain Brook, Alabama. Micah Green Holloway and Porter Rivers were cowinners of the John R. Mott Award. This award is given to men in the graduating class who best represent high character, scholarship and student public service. Holloway is a business administration major from Birmingham, Alabama. He was recognized for his many contributions to campus life, including his service as a Samford Ambassador, Connections leader and leader of RANSOM campus ministry. Rivers is a finance major from Selma, Alabama. He was noted for his active role in SGA for the past four years, beginning his tenure as freshman class president and ending his time as student body president. Rivers is a member of Sigma Chi fraternity. Natalie Marshall was named winner of the James M. Sizemore Award as the student in the senior class who best demonstrates character, personality, scholarship and unselfish service to Samford. Marshall was cited as being deeply invested in both the Samford and local community. She has faithfully served as a resident assistant and volunteers in Samford’s service immersion trips. The committee noted that she “is described by her peers as compassionate, understanding and purposeful.” Marshall is a human development and family studies major from McKinney, Texas.